In previous posts and my 2007 essay, "Ethical Training for Oral Historians," I have complained about standardized, medicine-centric ethics training systems like the CITI Program and called for training programs better tailored to individual disciplines. Lisa Wynn of Macquarie University (also known as MQ) has alerted me to just such a program she created with Paul H. Mason and Kristina Everett. The online module, Human Research Ethics for the Social Sciences and Humanities, has some elements that I find inappropriate. Overall, however, it is vastly superior to the CITI Program and comparable ethics programs I have seen, and it deserves attention and emulation. The CITI Program's "History and Ethics" module offers five "Events in Social & Behavioral Research" as cautionary tales. Two concern psychological experiments (Milgram and Zimbardo), two concern decades-old observations using deliberate deception (Wichita Jury and Laud Humphreys) and the last is Francis Flynn's more recent, but also deliberately deceptive, study of restaurant responses to customer complaints. This choice of examples suggests that the only ethical dilemmas facing ethnographers concern deception, and that they do not occur frequently. The University of Iowa's Ethical and Regulatory Issues in Ethnographic Human Subjects Research is broader in its concerns, but offers few concrete examples. The MQ program, by contrast, offers two old stories (Zimbardo and Humphreys), but it freshens them with stories of two recent controversies: the U.S. Army's recruitment of social scientists for its Human Terrain System initiative and Sudhir Venkatesh's doctoral research in underground economies in Chicago. Another case study appears in the section on "Research with Aboriginal and Torres Strait Islander Peoples," describing the collection of stories, songs, and artifacts by anthropologist Ted Strehlow. These collections have become the subject of considerable controversy, and the program offers both Strehlow's perspective and that of his critics. Beyond these case studies, the MQ program offers short vignettes in which ethnographers had to decide how to conduct research without hurting their informants or themselves. In some cases, the researchers are given pseudonyms; in others, real names. The authors even include accounts of dilemmas they themselves have faced. The stories that make up the bulk of the MQ program are more relevant to today's ethnographers than hearing about what Laud Humphreys did forty years ago, or about recent medical research gone wrong. 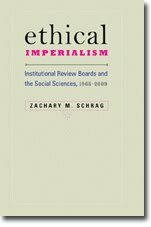 They show that ethical challenges are not confined to the distant past, but face social scientists today. And they broaden the challenges facing scholars to questions of confidentiality, government sponsorship, intellectual property, and other contemporary concerns. Best of all, these stories emphasize real ethics, rather than the regulatory compliance at the heart of the typical program. When I went back to the CITI Program to write this entry, I was immediately confronted with a quiz question about whether a hypothetical foreign institution needed its own federalwide assurance for a hypothetical project. I'm sure this is very important to some IRB administrators, but it is absurd to demand that every researcher master such arcane requirements. The MQ program is not wholly free of this dross, but it is better than others I have seen. Like other training programs, the MQ program is heavy on examples of what not to do. But it also offers something else: a positive example. One section describes how medical anthropologist Paul Farmer not only studied tuberculosis in Haiti, but also established a medical clinic there. As inspirational as this story is, I think this section could be expanded to offer stories of ethnographers who helped communities simply by doing good ethnography--not by providing medical care. Oral historians often get to work with people who are happy to have their words recorded for posterity. I would hope that sociologists and anthropologists have equally gratifying experiences. The MQ program does offer additional readings, which may contain these kinds of examples. The CITI Program lists "Events in Social & Behavioral Research" with attendant "ethical problems." The MQ program, by contrast, describes "ethics controversies" and "debates about the ethics," suggesting that there is no single right answer to the conundrums faced by scholars in the field. There are no multiple choices here, just a stark presentation of an ethical challenge a scholar might reasonably face. Elsewhere, the program does offer multiple choice quizzes, but not with the simplistic approach of the CITI Program. For example, one screen invites the user to choose one of four strategies for avoiding the revelation of confidential information. Whatever one chooses, the program replies that "any of the above are possible strategies for protecting your informants' identities, but some are better strategies than others," and then elaborates. The MQ program respects its students by adhering to two basic norms of scholarly writing. The first is citation. Many of the CITI Program's statements are unattributed, and in some cases factually inaccurate. When a statement is attributed, the program often gives just a single source. The MQ program, by contrast, provides several readings for each of the case studies it presents, in some cases with alternative viewpoints. The program also provides citations for statements throughout the text, adding authority. A warning that the U.S. government might seize a scholar's laptop at an airport might sound alarmist were it not for a link to a news article on the subject. Another norm is that of open access. Many ethics training programs are open only to affiliates of a single university or, in the case of CITI, to affiliates of institutions that subscribe to the service. This robs scholars of the chance to compare and critique rival systems, to find areas of agreement and disagreement, to check facts, and to do all the other work that scholars usually do in their quest for truth and wisdom. The MQ program requires registration, but that registration is free and open to all. Better still, the authors have licensed the text under a Creative Commons Attribution Non-Commercial Share Alike license, giving others the chance to "download, redistribute, remix, tweak, and build upon the text of this work non-commercially, as long as they credit the original authors and license their new creations under the identical terms." These two decisions offer the opportunity and the challenge for other institutions and disciplines to provide even better training. The downside of such openness is that it leaves a training program open to criticism from cranky bloggers halfway around the planet. Let's move on to some of the program's weaknesses. The first section of the Macquarie program takes readers through about 15 screens concerning the history of abuses by medical researchers--Nazis, Tuskegee, and the more recent, dubious drug trials in Africa--along with descriptions of the various ethical codes designed to prevent recurrences. I hate this. It presents biomedicine as the archetype of research and social research as a deviation from that norm. And it's just bad pedagogy to start a course with material not important to the student. If this is truly training for the social science and humanities, why not tell just the story of ethical debates in the social sciences and humanities? Or, if social scientists must know about Nuremburg and Tuskegee in order to communicate with university ethics officers, why not leave that to the end? The MQ program is entitled "Human Research Ethics for the Social Sciences and Humanities" and it notes that "social science research -- including psychology experiments, quantitative surveys, oral history collection, and ethnographic research or participant observation -- raises its own peculiar problems for ethical research practice." (24) But the program does not give equal weight to the problems of each type of research or the ethics embraced by its practitioners. Conduct in Human Research concedes that its broad definitions "could count poetry, painting and performing arts as research." [2:8]) Instead, almost all of its examples, and its quotations from ethics statements, come from anthropology. Presenting case studies and ethical statements from all the fields in the social sciences and humanities would bloat the training program beyond usefulness. Rather than add more content, the program should strip references to survey and oral history research and adopt a more humble title: "Human Research Ethics for Ethnography." Since when are these "basic tenets" of ethical research? For anthropology, the answer would seem to be only since the 1990s. [Carolyn Fluehr-Lobban, "Ethics and Professionalism in Anthropology: Tensions Between Its Academic and Applied Branches," Business and Professional Ethics 10 (1991): 57-68.] For other scholarly disciplines, the answer is not yet, particularly since the idea of "do no harm" would preclude investigative journalism and other critical inquiry. For many scholars, bringing harm to a malfeasor is highly ethical practice, but the MQ program seems to think that all scholars have embraced anthropology's gentleness. I find this narrowness particularly disappointing because just last summer, Wynn herself raised the question of disciplinary differences in a post about HTS on Culture Matters. She understands that anthropologists are unusual in some of their ethical beliefs, and I wish that insight had made it into the MQ training. I have additional concerns about the treatment of two of the four social-science case studies in the program. As for the section on the Human Terrain System, it is based almost entirely on the writings of critics. For example, the program asks,"If the anthropologist has no control over what the military will do with the information, then how can an anthropologist fully explain to people the real risks involved in research?" Not only does this question ignore the fact that not all Human Terrain team members are anthropologists, it also assumes that those members do not control the information they gather. For a challenge to this assumption, see Adam Silverman, "The Why and How of Human Terrain Teams," Inside Higher Ed, 19 February 2009. Writing this review was slowed considerably by the poor design of the MQ program's site. The program consists of 103 screens which must be viewed one at a time. Since one must often scroll down to reach the "next" link, it took hundreds of mouse actions to get through the site. With a big enough monitor, you can enlarge the window to include all the text and the navigation links without scrolling, but then you end up with line lengths of 100 or more characters, making the text hard to read. If you stop clicking for a while, the site logs you out. And while you can return to the chapter you were on, you cannot navigate straight to the page. So if you pause to take notes, as I have while writing this entry, you may need several hundred mouse clicks to get through the whole program. I also found a noticeable pause after each screen, further delaying my reading. There is no way to print or download the site's text in large chunks. Text this important shouldn't be an ordeal to read, and I am sure than the authors would never try to publish a journal article of comparable length in this format. They need to find a better way to present this material. For example, they could collapse the 100+ screens into just six pages--one for each of the six major sections--allowing users to view on screen, print, or save as needed. The MQ program ends with a quiz composed of a few dozen multiple-choice questions about the material covered in the main text. In several cases, I found none of the answers satisfactory. In other cases, the quiz presented two opinions as choices and demanded the "right" one. More frequently, the quiz posed silly questions, like asking about what provisions are included in which codes. Much as I believe in the power of historical knowledge, knowing whether the Nuremberg code included the right to withdraw from an experiment is of no obvious use to an ethnographer working today. And the quiz didn't even tell me which questions, if any, I got wrong. The quiz section was also heavy with typographical errors, making me wonder if it was written by someone other than the main authors of the MQ program. It is a shame to end such an innovative program on so sour a note. There may be a bureaucratic need to include a quiz at the end; some administrator at MQ can now check that I have completed the training. But I see little pedagogic need for the quiz, since the program itself (after the medical ethics portion) is bound to be compelling to any ethnographer concerned with ethical research. Wynn, Mason, and Everett have put tremendous thought and effort into determining what ethnographers need to know about research ethics, and packaging that knowledge in a way that is respectful of researcher's learning, intelligence, curiosity, and desire to act ethically. They go too far when they claim that the ethics currently embraced by Australian and American anthropologists are universal to social scientists, and they at times make statements that lack nuance. But rather than proclaim these ideas as gospel, they have designed a training program that itself invites debate. I hope that other universities and other scholarly disciplines will follow their example. Deregulation "Is Not Going to Happen"